Azimut Food and Water Dispenser is a practical dispenser that can be used for both water and dry food. Made from a durable easy-to-clean plastic, the feeder has a contoured shape to make it easy to grip, a non-slip rubber rim, and a transparent tank with a useful capacity gauge. 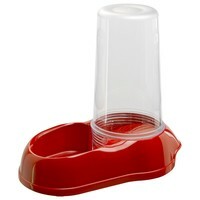 This multifunctional dispenser is available in various sizes, making it the ideal accessory for all breeds of cat and dog. Please Note: Colour may vary and cannot be guaranteed.